• For quantitative determination of neuraminidase activity and screen for neuraminidase inhibitor. • Sensitive and accurate. Linear detection range at 37?C in 96-well plate: 0.1 to 10 U/L for colorimetric assays and 0.01 to 2 U/L for fluorimetric assays. • NEURAMINDASE (also known as Sialidase) is an enzyme that hydrolyzes terminal sialic acid residues on poly-saccharide chains. It is predominantly expressed in microorganisms such as bacteria and viruses. Cleavage of sialic acid residues by neuraminidase is believed to play several roles in infection by influenza viruses. It is thought to assist in the penetration of mucosal linings, the invasion of target cells, the elution of progeny viruses from infected cells, and the prevention of self-aggregation. Thus, neuraminidase is an important target for influenza drug development and simple, direct and automation-ready procedures for measuring neuraminidase activity find wide applications in research and drug discovery. 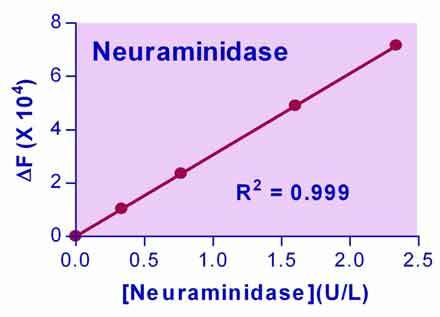 BioAssay Systems neuraminidase assay measures the sialic acid released by neuraminidase in one step. The change in color intensity of the reaction product at 570nm or fluorescence intensity at λex/em = 530/585nm is directly proportional to neuraminidase activity in the sample. 1. Could you tell me the chemical components of the substrate? What kind of sialic acid? The substrate is fetuin, a heavily sialidated protein from fetal bovine serum. Our assay is based on the detection of N-acetyl neuraminic acid (NANA, Neu5Ac) in a coupled enzyme reaction leading to the formation of a colored and fluorescent product. Influenza neuraminidase will cleave terminal NANA residues from fetuin.